Visual Studio has a lot of functions and shows in the standard adjustment a lot of overloaded Toolbars and Context-Menus. The result is that Visual Studio seems to be much overcharged – at least for me. So here comes the ultimate Quick tip: we are going to blend out everything that is not necessary. Click right on the Toolbar and erase the dispensable symbols. Some Toolbars are depending on the filetype – XSLT and XML buttons you will find only in files which includes XML. Sometimes the Buttons/Functions are double because of this I didn’t found out how to get the “Convert to Web Application” Button out of the Project Context-Menu (after 15 Minutes of searching I’ve aborted it. But it’s possible to add new functions like for example “Start Batch Files on a Context-Menu Entry”. 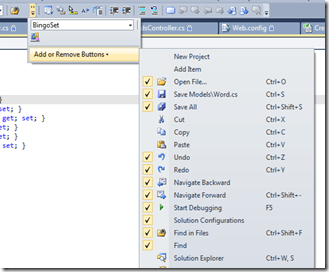 Test it out if you need all of the Buttons in the 5 Toolbars of Visual Studio. For me it’s very confortable to work with the slim Visual Studio. If you have installed for example the Visual Studio Power Tools you should think of using the Solution Navigator instead of the classic Solution Explorer – both is IMHO dispensable (both have their Advantages and Disadvantages ). 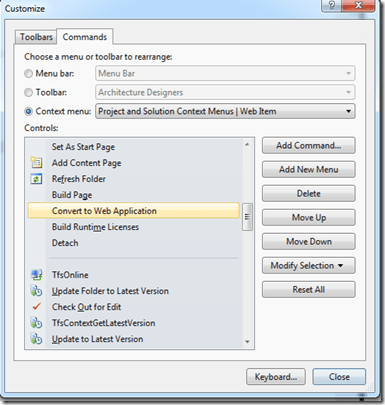 Reslut: It’s possible to edit the Context-Menu of Visual Studio but it takes a lot of time .